The Wisconsin Supreme Court will examine two significant issues in Meyer v. Meyer, 2000 WI App 12, 232 Wis. 2d 191, 606 N.W.2d 184 (1999). On Feb. 22, the high court granted review of the Court Appeals decision, to focus upon whether a court in a maintenance determination can consider a period of premarital cohabitation, and whether a professional degree is an asset for purposes of an unjust enrichment claim. This article will discuss the first issue; a subsequent article will deal with the second. Julie and Joseph Meyer met in March, 1985. They began spending nights together in February, 1986. In 1989, they rented an apartment together and moved into a house the following year. In 1992, they purchased a duplex together. They married in May, 1993. Julia filed for divorce in June, 1997. In its decision, the trial court noted that while the marriage lasted only four years, maintenance of eight years was appropriate, in light of the history of the parties’ relationships, including the approximately six years of premarital cohabitation. The Court of Appeals reversed. Relying on Greenwald v. Greenwald, 154 Wis. 2d 767, 454 N.W.2d 34 (Ct. App. 1990), the court held that, as a matter of law, premarital contributions cannot be considered in maintenance and property determinations. The appellate court proceeded to remand the case with directions to the trial court to determine maintenance without consideration of the premarital cohabitation. In reversing the trial court, the court of appeals distinguished its decision in Wolski v. Wolski, 210 Wis. 2d 184, 565 N.W.2d 196 (Ct. App. 1997). In Wolski, the court held that where parties remarried each other following a divorce, a trial court could properly use the combined years of marriage when setting maintenance. The Meyer court found that the holding in Wolski applied only to years of marriage, not to periods of cohabitation. Though the court of appeals in Meyer was required to follow its prior holding in Greenwald, the supreme court is not so constrained. For many years, Wisconsin did not permit any cause of action for parties who cohabited, finding these relationships to be “meretricious.” In 1987, the Supreme Court overturned this precedent and recognized causes of action for cohabitants. See Watts v. Watts, 137 Wis. 2d 506, 405 N.W.2d 303 (1987); Lawlis v. Thompson, 137 Wis. 2d 490, 405 N.W.2d 317 (1987). 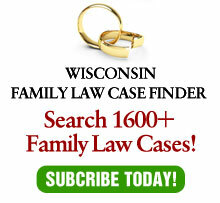 Wisconsin has long recognized the broad discretion of trial courts in setting maintenance. Some of this authority is founded in the broad “such other factors as the court…may deem relevant” catch-all provision of Wis. Stat. § 767.26(10). For example, in Brabec v. Brabec, 181 Wis.2d 270, 510 N.W.2d 762 (Ct. App. 1993), the court affirmed the denial of maintenance to a woman who conspired to have her husband killed. The court avoided dealing with the “no fault” provisions of Wisconsin law by holding that the trial court properly considered the wife’s misconduct under Wis. Stat. § 767.26(10). What is truly different about cohabitation? Why is it allowed as a separate cause of action, but the family court must turn a blind eye to it? Given the increased prevalence of cohabitation, an increase of 445% from 1977 to 1997, according to U.S. government census statistics – the societal censure of cohabitation has greatly diminished. As previously indicated, the applicability/distinguishability debate concerning Greenwald contained in the Court of Appeals decision need not be the predominant consideration of the supreme court in its disposition of Meyer, as the high court is not bound by Court of Appeals precedent. In making its decision, it is submitted that the court should include in its considerations: The frequency of premarital cohabitation in modern society, the difficulties in apportioning credits between premarital, marital and post-marital periods of contributions, and the desirability to promote and maintain judicial economy.